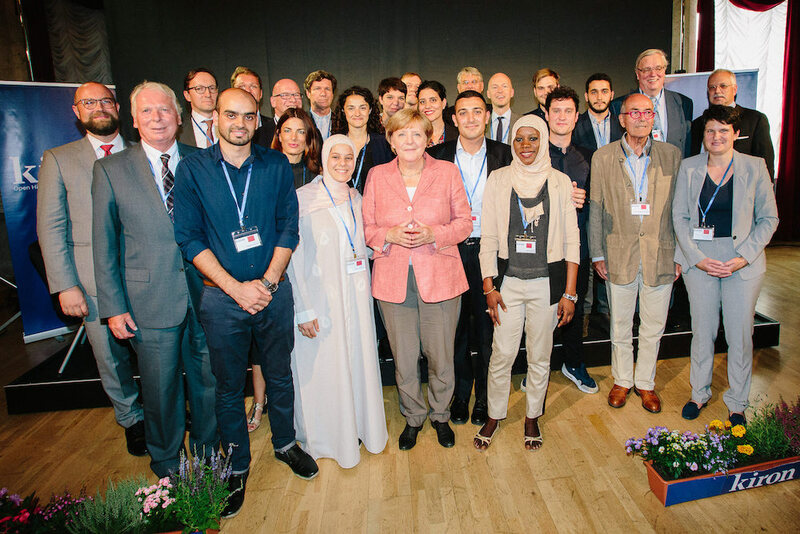 This August, Coursera for Refugees learners met with German Chancellor Angela Merkel at Kiron Open Higher Education, a Coursera for Refugees partner, in Berlin. At the Kiron-hosted event, five refugee learners shared their personal experiences being newcomers to Europe with Chancellor Merkel, a small group of German corporations and philanthropists, and Coursera staff. One key point of discussion was online learning, which has been a major tool in providing refugees with a sustainable path to higher education. Of the more than 1.1 million refugees who arrived in Germany between 2015 and 2016, many have struggled to begin or continue higher education. But now, some German universities are recognizing coursework completed on Coursera, greatly increasing the ease of matriculation, particularly for refugees. Five refugee learners, German Chancellor Angela Merkel, German corporations and philanthropists, and Coursera staff meet in Berlin to discuss online learning for refugees. Each refugee learner who attended the event had a unique story. For example, 27-year-old Moataz came to Germany from Damascus, Syria and is one of the first students transferring to a Kiron partner university. This winter he’ll begin studying at the BAU International Berlin-University of Applied Sciences. Another attendee, Nyima, is planning to start studying political science at the Duale Hochschule Baden-Württemberg. As a consequence of her work as a journalist covering human trafficking in her home country of Gambia, Nyima was forced to flee, leaving her family behind. Despite the challenges she’s already encountered, she still possesses a drive to tell the truth. Currently, she works for a refugee journalism project called “LISTEN” and helps other refugee voices be heard. And then there’s Ahmad, who in 2015 was forced from Syria to Turkey to Cyprus finally arriving in Germany. After half a year of online learning and successful completion of 23 online courses, he transferred to Bard College Berlin, where he now studies Politics, Economics and Social Thought. Because the online courses he took were recognized by the university, he was able to finish his Bachelor’s degree early. Kiron Open Higher Education is a nonprofit organization that provides access to higher education for refugees through scalable digital technology and strategic partnerships with universities and online education providers. Through an online platform, Kiron Campus, motivated students who are not yet eligible to study in their host country can enroll in online courses, complete rigorous curricula equivalent to those offered by traditional universities, and receive academic guidance. Coursera offers classes from 150 of the world’s best universities to Kiron’s online platform. Approximately 40% of the Kiron curriculum is composed of courses on Coursera. As soon as students fulfill the requirements to study in their host country, Kiron assists them in applying to a university. If accepted, students may apply for the recognition of completed online coursework and continue studying offline towards an accredited bachelor’s degree. Kiron has built partnerships with universities around the world, with majority of them in Germany, Jordan, and France. Coursera is proud to partner with Kiron and provide access to the world’s best learning experience to such an impressive group of young people. The dedication to education these students demonstrate in the face of unimaginable challenges must be matched by a willingness on the part of government and educational institutions to facilitate their learning, and, ultimately, their ability to build a new life in their host country.